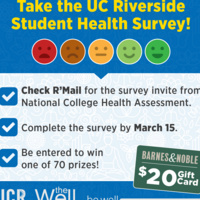 As a currently enrolled UC Riverside student, you have the opportunity to participate in the National College Health Assessment (NCHA) sponsored by the American College Health Association (ACHA). This survey is designed to assess student health behaviors in order to provide better services and support for UC Riverside students. All your answers will be confidential and the information collected will be used to develop wellness programs and services for UCR students. We encourage you to complete the survey in one sitting, which typically takes about 20-30 minutes. All students who submit a survey will be automatically entered in a random drawing for one of seventy $20 gift cards for Barnes & Noble or Dining, or one of twenty-five other prizes (sweatshirt, tote-bag, or lunch bag)! Look for the survey in your email, starting on February 5th!